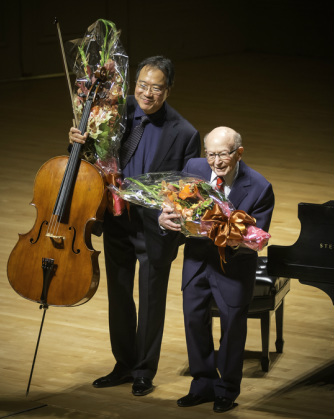 Yo-Yo Ma and Terezin survivor George Horner take their bows at our 2013 Gala. Garrick Ohlsson teaches a master class at Prague's HAMU Music Academy. Made possible by TMF's Emerson-Ondricek Fund. Simone Dinnerstein premiered Nico Muhly's TMF Commission at Symphony Hall, Boston. 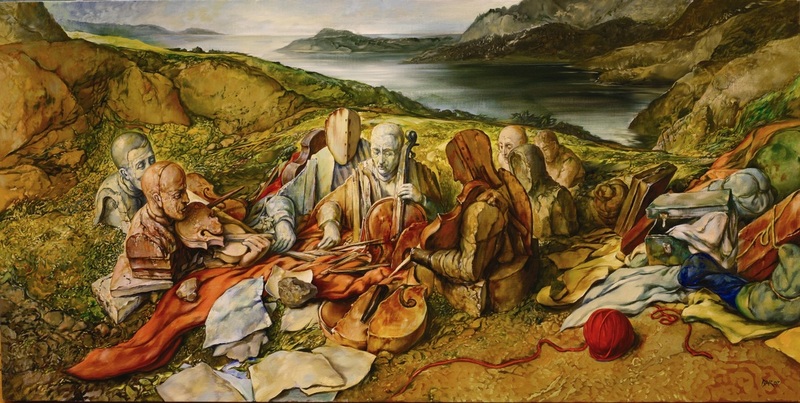 The painting below is "Accidental Music," by 2012 TMF Terezin Legacy Award recipient Samuel Bak. Mr. Bak is a renowned painter and a survivor who held his first exhibition inside the Vilna Ghetto at age nine. The hands of the musicians in this image were modeled by the Hawthorne String Quartet, members of the Boston Symphony Orchestra who have helped TMF champion the music of Terezín and the TMF mission since our inception in 1991. Image courtesy of the Pucker Gallery, Boston. JCRC Yom HaShoah Holocaust Commemoration at Faneuil Hall, Boston, 10:30 am April 12. We will perform music from Terezin. TMF/Temple Israel/Temple Sinai Yom HaShoah Holocaust Commemoration and Concert at Temple Israel of Boston, 2:00 pm April 12. Syracuse University Residency, featuring Holocaust education and concert programs, January 22-25. Education program with Dr. Anna Ornstein at North Reading Middle School, March 9. TMF Educator Edgar Krasa (at left) and TMF Director Mark Ludwig gave a presentation lasting more than two hours to middle-school students at The Waldorf School in Lexington, Massachusetts. 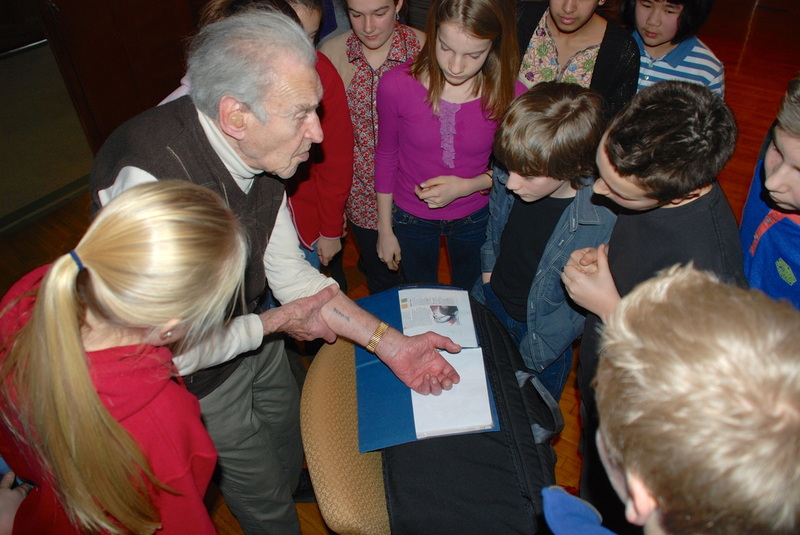 With slides and live music, they discussed the power of music and art in Terezin, and Edgar shared his personal stories of surviving Terezin, Auschwitz, and the infamous Death March. Thank you to The Waldorf School for a truly memorable morning with your lively and thoughtful students. 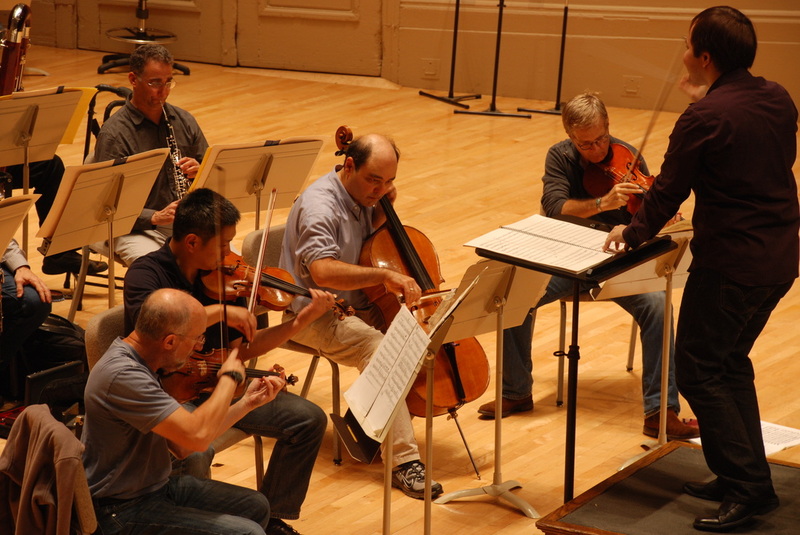 This extraordinary October 22 event at Symphony Hall in Boston featured a historic performance by Terezin survivor George Horner, the American debuts of two TMF Commissions, Yo-Yo MA performing Bach—and it was covered in the international media. Please click here for many more wonderful details than will fit in this brief listing. Featuring BSO clarinetist Thomas Martin with the Hawthorne String Quartet, and a performance of the “Slow” movement from the Andre Previn Clarinet Quintet, a TMF Commission sponsored by Carol and Joe Reich. JFK Presidential Library & Museum and Northeastern University’s Fenway Center, Boston. Premiere of the documentary about the Holocaust education program produced last year by TMF, the Institute for Holocaust Education, and the Omaha symphony Orchestra with Thomas Wilkins. Explores how young students learn about the Holocaust and about the significance of art and music in Terezín. Shown at U. Nebraska-Lincoln and on TV at CT on NET1. Talks by National Center for Jewish Film Director Sharon Rivo, Wabash College Dean Gary Phillips (about the art of Samuel Bak), and Slavics scholar Maxim Shrayer. At the Nahant Village Church in Massachusetts. Presented in collaboration with the Terezín Music Foundation. Works by Antonin Dvorak, Bela Bartok, Viktor Ullmann, Pavel Haas, and David L. Post, whose “Fantasia on a Virtual Chorale for String Orchestra” is a TMF Commission. At The Center for the Arts at the Armory, Somerville, MA. TMF Executive Director Mark Ludwig teaches the course "Art and Music During the Holocaust and Third Reich," with guest speakers Anna and Paul Ornstein, survivors and TMF Board Members. Our Annual Yom HaShoah Commemoration and Concert. "Musical Healing After the Holocaust"
Presented by TMF and the Choral Department of Reading Memorial High School. We showed the documentary film "Creating Harmony: The Displaced Person's Orchestra at St. Ottilien," by John Michalczyk; five local choral groups will provide accompaniment. A panel discussion followed, with TMF Executive Director Mark Ludwig and two survivors and Holocaust educators: Edgar Krasa (founder of TMF's Krasa-Schaechter Fund) and Dr. Anna Ornstein. The program closed with a performance by Mark Ludwig of music composed in Terezín. The TMF Prague Spring Tour and Prague Spring FestivalConcert. Each year TMF collaborates with the Prague Spring Festival to produce a concert featuring a new TMF Commission premiered by leading artists. 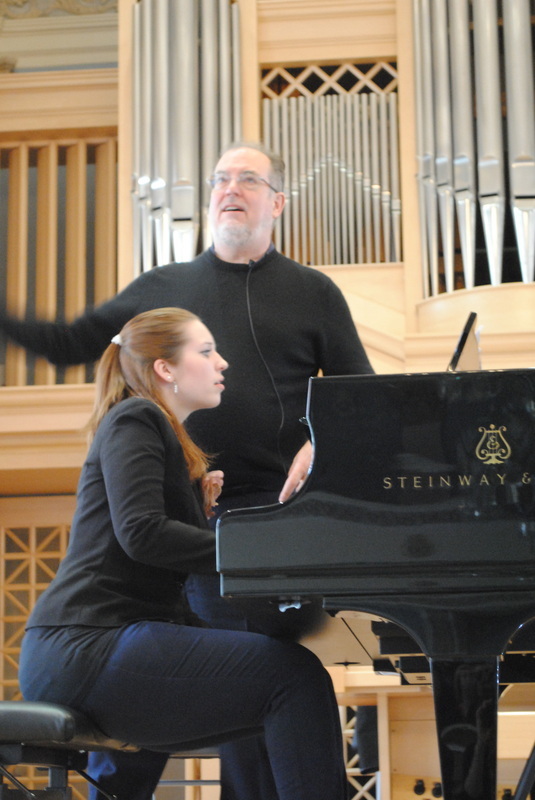 On May 26, Garrick Ohlsson premiered Lubica Cekovska's work for solo piano. May 27 Mr. Ohlsson led a master class sponsored by TMF and the U.S. Embassy, Prague. Andre Previn's Clarinet Quintet, a 2011 TMF Commission sponsored by Joe & Carol Reich, was performed at the JFK Museum & Library on January 20, as part of the Boston Symphony Orchestra Community Chamber Concert program. Clarinetist Thomas Martin performed with the Hawthorne String Quartet. [Listen] Maestro Previn fled the Nazis with his family as a child, and his Quintet, sponsored by Joe and Carol Reich, is imbued with hope and memory. In honor of Martin Luther King Day, The Hawthorne's encore was Karel Svenk's cabaret piece "Why Does the Black Man Sit in the Back of the Bus?" written in Terezín. Intensive Holocaust education eight-day residency in Omaha, October, 2012. Produced by TMF and the Institute for Holocaust Education (IHE). More than 500 students from Omaha’s diverse communities explored the role of the arts and music during the Holocaust, using the TMF Study Guide and CD, “Finding a Voice,” with materials developed by IHE. 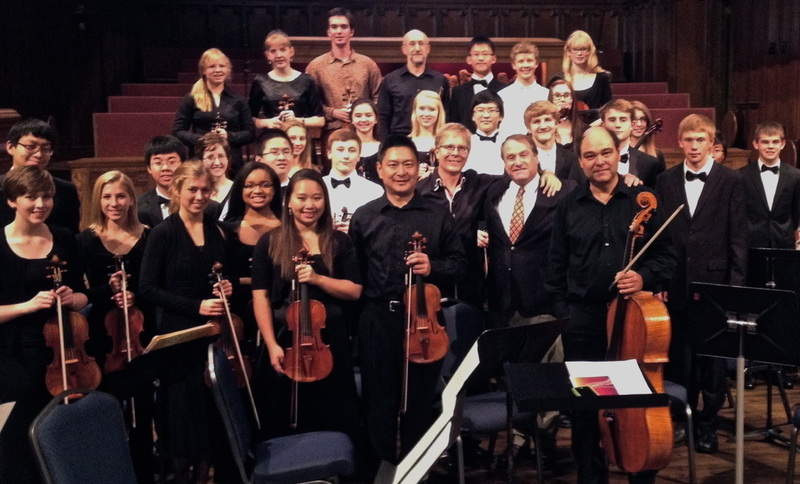 The Omaha Youth Orchestra and Children’s Choir, joined by the Hawthorne String Quartet, performed three TMF Commissions (by David Post, Thomas Oboe Lee, and Stephen Feigenbaum) in an interfaith concert hosted by the Dundee Presbyterian Church of Omaha. TMF produced a program titled “Silenced Voices of Terezín,” to benefit the Institute for Holocaust Studies. The Hawthorne String Quartet performed works composed in Terezín and Hans Krasa’s 1923 String Quartet, with artist Jim Schantz. 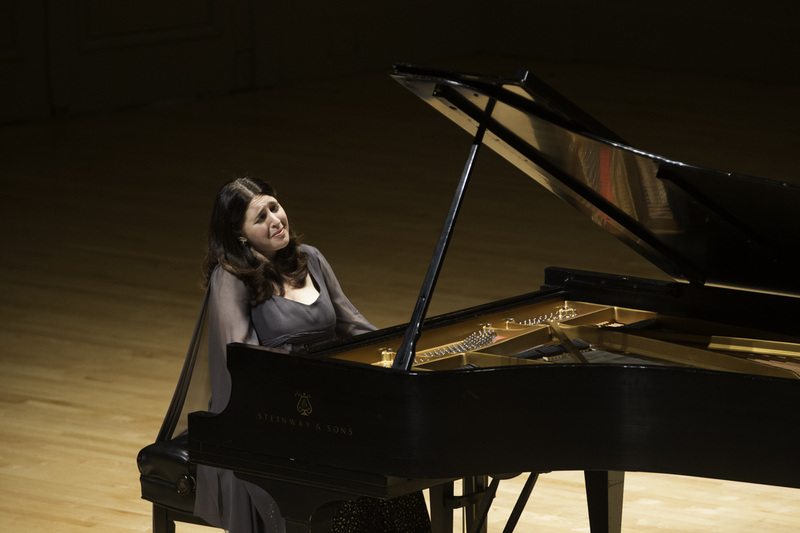 "Dinnerstein and Upshaw captivate with glowing performances. . . . The Muhly premiere [is] a brilliant piece for solo piano." Babi Yar Candle-Lighting Memorial performance. 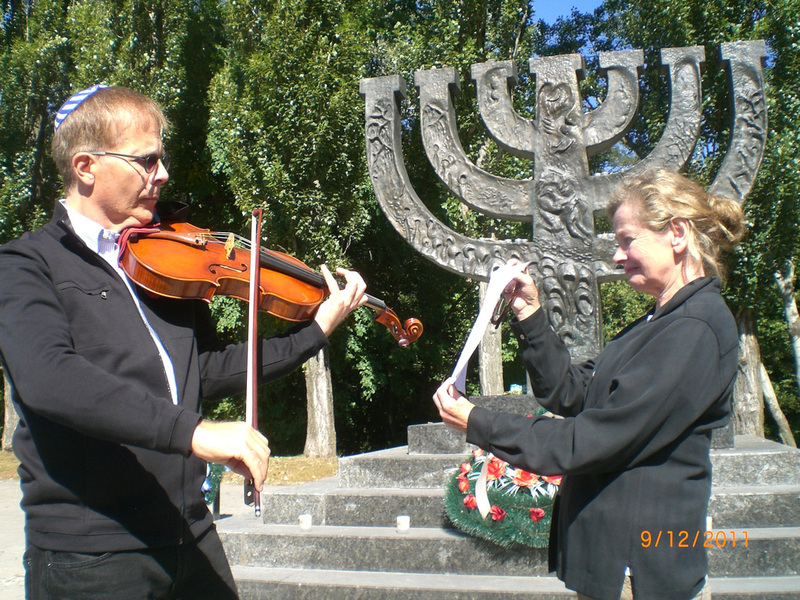 As part of the US Holocaust Memorial Museum tour in the Ukraine, TMF director Mark Ludwig performed music from Terezín to memorialize the 70th anniversary of the massacre that took place in Babi Yar. Program for middle- and high-school students at the Waldorf School, Lexington, Massachusetts. January 28, 2012 Mark Ludwig and the Hawthorne String Quartet presented a two-hour program on art and oppression during the Nazi era, with performances of works by Gideon Klein and Viktor Ullmann. Edgar Krasa told his story of surviving Terezín and Auschwitz. Yom HaShoah candle-lighting and concert. Clarinetist Thomas Martin and the Hawthorne String Quartet performed the André Previn Clarinet Quintet, a 2011 TMF Commission, plus Gideon Klein’s Duo for Violin and Cello. Produced by TMF and Temple Israel of Boston on April 22, 2012. Dates for our 2013 Yom HaShoah concerts are here. Boston-wide Yom HaShoah Holocaust Commemoration. 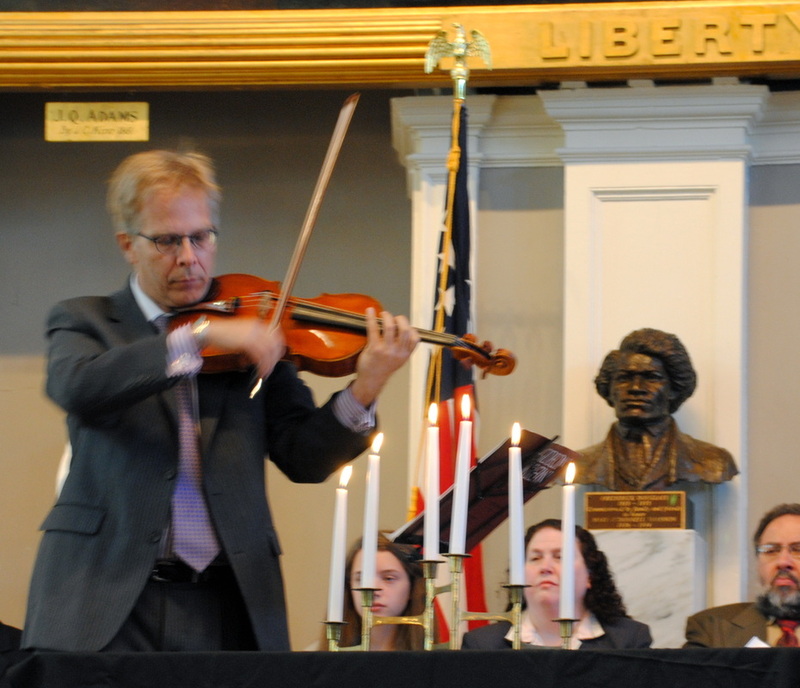 TMF Executive Director Mark Ludwig spoke and performed Gideon Klein’s “Lullaby,” written in Terezín, at this annual Jewish Community Relations Council event on April 29, 2012 at Faneuil Hall, Boston. Music by Gideon Klein can be heard here.